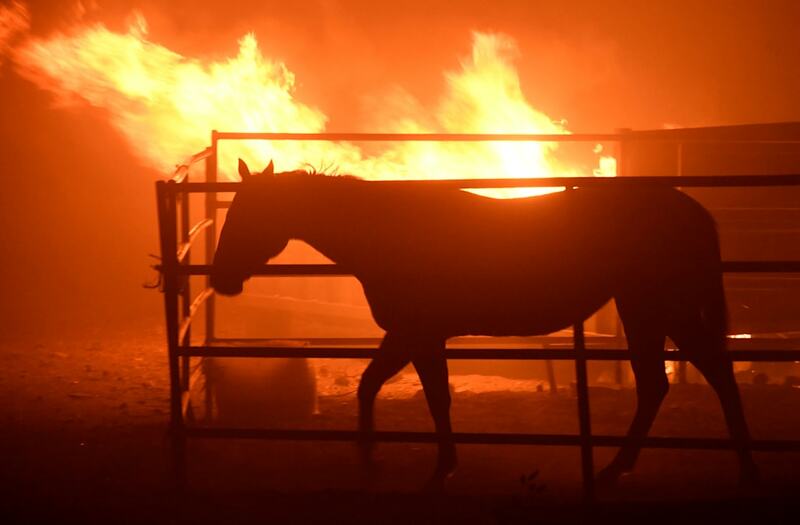 DEL MAR, Calif. (FOX5 San Diego) -- Johavany Catalan was in charge of 77 horses at the San Luis Rey horse facility in Bonsall when the Lilac Fire broke out. Now, he and his crew have nightmares of it. Catalan and his crew had just finished working with the animals and were about to head home when the flames reached the barn filled with expensive thoroughbreds. Catalan and his men made the decision to go into the burning barn to rescue the horses. They opened the gates and implored the horses to run for their lives. Catalan recalled having to jump over flames to get into stalls where some of the horses were shaking and too petrified to move. With the thick smoke bearing down on them, they coaxed 74 of the horses out. But it would take more than a day to locate them and round them all up. The rescued horses are now with Catalan and his crew, who are staying at the Del Mar Racetrack. "There's a little trauma in our heads, but only when we try to sleep. During the day when we're working we don't think about it. We don't remember anything. But when we try to sleep everything comes back to our minds, everything, everything," said Catalan. There's a call by some to bring Spanish-speaking counselors to the track to help Catalan and the others. Although, Catalan says he doesn't need it. World-renowned jockey Julie Krone posted the following on her Twitter account asking for help for the grooms who risked their lives and lost all they had while saving the horses. Please if you are Spanish speaking and Psychiatrist or Psychologist please come to Delmar and talk with the racetrack grooms . Lots of nightmares and people still shaking . Help needed from healers too.